Contact us for better pricing! The VTrak J5920s is a key element of next-generation disaggregated storage and software-defined storage (SDS) systems , delivering high density and the flexibility to balance performance with cost. 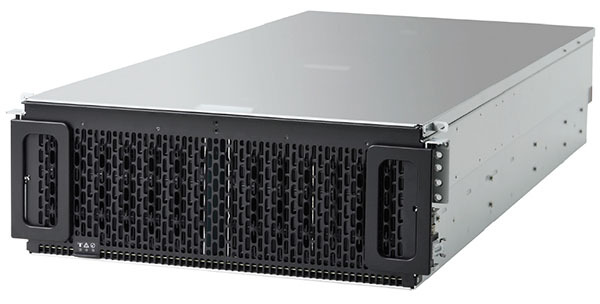 The VTrak J5920s provides up to 1.2 PB1 of raw storage in a compact and efficient form factor. HGST HelioSeal drives ensure cool running, quiet operation and high reliability. A high performance data tier can be set up for demanding applications by using SSDs in up to 24 of the drive slots. Conventional dense disk shelves frequently suffer from performance degradation due to induced vibration from adjacent drives. Traditional platforms also have cooling challenges as the cooling air passes over successive rows of drives, losing effectiveness as it gets heated up along the airflow path. Developing storage devices and platforms side-by-side, we address these challenges through vertical innovation, a set of technologies developed based on a holistic view of devices, platform, and their interactions. The first two of these patented technologies are IsoVibe and ArcticFlow. IsoVibe reduces vibrationinduced performance degradation, while ArcticFlow overcomes the cooling issues by introducing cool air into the middle of the platform. Both these technologies contribute to long-term reliability, enabling our three year limited warranty on the entire platform. This new platform addresses the demanding storage needs of large enterprise customers, storage OEMs, cloud service providers and resellers/integrators that require dense, shared HDD or hybrid storage. The VTrak J5920s provides the flexibility to specify the HDD and SSD combinations to balance capacity, performance and cost. Precise cuts in the baseboard provide a suspension for the drives in the chassis, isolating them from transmitted vibration. The result is that consistent performance is maintained, even when all the drives are working hard. By introducing cool air into the center of the chassis, drives operate at lower and more consistent temperatures than conventional systems. This results in lower fan speeds, reduced vibration, lower power consumption, quieter operation and ultimately higher reliability. Download the PROMISE VTrak J5920s Datasheet (PDF). PROMISEWorks.com is a division of Virtual Graffiti Inc, an authorized PROMISE Technology reseller.